Whissendine Environment Group (WEG) was set up from the Parish Plan to take action, through practical projects and community engagement, to make Whissendine a greener, more sustainable and more attractive community to live in, working closely with the Parish Council and other village groups. Following last year’s volunteer working parties to clear the no- mans land ready for the tree surgeons, WEG has (thanks to the sponsorship from The Cory Environmental Trust in Rutland and the Whissendine Parish Council) dramatically improved a footpath in Whissendine, restoring a hedgerow and creating a nature area in the process. In the last 12 months WEG have had further working parties to plant the hedging whips, put up bird boxes, plant native wild flower species and clear over growth to allow the area to become more diverse. In the summer Cory Trustees visited the area and met with some of the WEG committee to see how the funding has been spent. 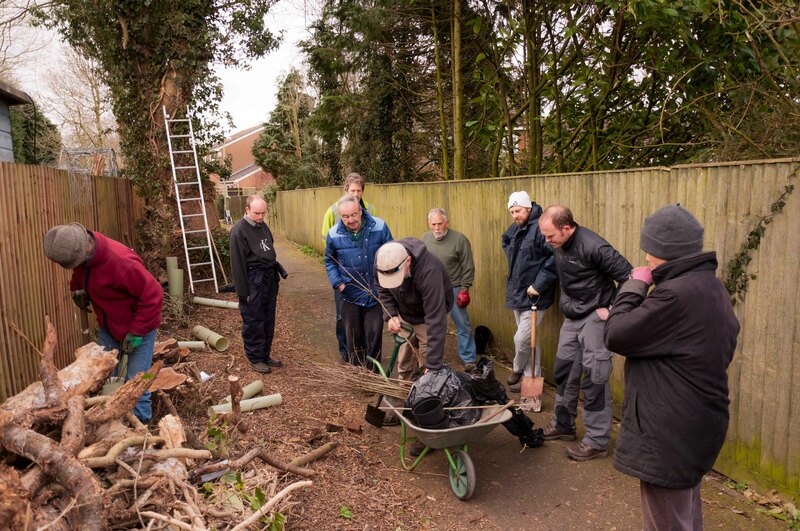 WEG volunteers are continuing to maintain the area which was left as no-man’s-land when the Foxhill housing was built over 30 years ago. Volunteers this January were trained by The Leicestershire and Rutland Wildlife Trust in hedgerow maintenance. WEG was nominated for the Environmental Achievement section and received a highly commended certificate at the awards ceremony. The Certificate is going to be put on display in the Village Hall. WEG volunteers are continuing to keep this area tidied and are looking to add some additional low growing bulbs and plants. WEG has given the Parish Council suggestions regarding the banks and has given advice to the siting of the replacement bridge and the idea of additional planting in the area. WEG is keen to be involved in the Village Neighbourhood Plan, and regularly raises concerns including footpaths, lighting and problems with dog mess with the Parish Council and Rutland County Council as appropriate.